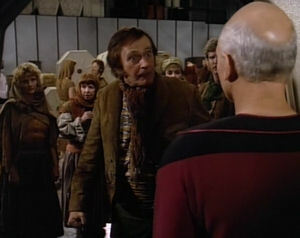 The Enterprise picks up two lost Earth colonies that have taken very different paths during the last two hundred years. You don't see Picard laugh very often, do you? The Mariposa clones want Riker's DNA, but Brenna already got some. La Forge shouldn't have told Riker and Pulaski that his eyes are like a human lie detector. That kills his poker advantage. Is Riker killing those clones ethical/moral? This episode is absurd, and the solution is stupidly convenient. Riker finds the idea of there being more than one of him repugnant. Little does he know, there is already another Riker out there, as we will see in the episode "Second Chances."